"she used to say, harlan pepper, if you don’t stop naming nuts…"
Having now made cashew butter for the first time, I can only hope that if you try it too, you don’t experience the same terrifying lows, dizzying highs and creamy middles that I endured to achieve one small bowl of camel-coloured paste. I first heard about cashew butter in a Baby-Sitter’s Club book, Dawn and the We Heart Kids Club, in fact. Who could’ve known that about fifteen years would pass before cashew butter had any further significance in my life? Please ‘scuse the green stain on the teatowel. I’ve now relayed this story dramatically on Twitter and Facebook, but for context, and because I’m not good at letting go of things easily, I’ll re-summarise here. I saw on Mrs Cake’s blog that she’d done homemade peanut butter, and breezily so, and I thought her method could be easily transferable to cashew nut butter. The sort of thing I read about – see above – but have never actually eaten. 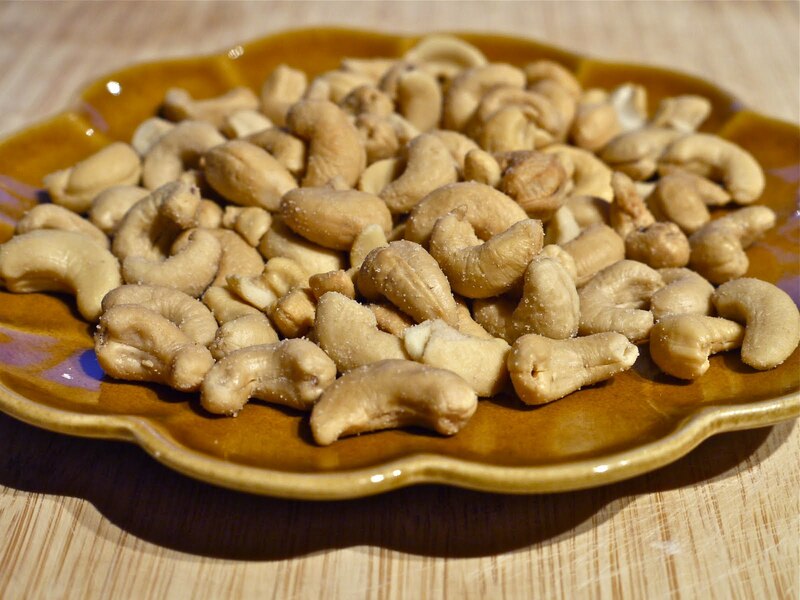 While pulverising my cashews in the food processor, I saw that a significant amount of cashew-matter had crept up the sides and remaining there, safely away from the whizzing blades. So, unthinkingly, I got my wooden spoon, poked it through the feed tube in the lid of the processor, and waggled it round to scrape down the sides. It worked! But then the blades forced everything back up again. Instead of sensibly turning it off and scraping down the sides with a spatula, I just stuck the wooden spoon back in the tube again. And dropped it. There was an awful noise as the processor was almost jumping around with the exertion of trying to blitz at full speed with a spoon jammed in it, and finally with a crash, the plastic tube broke, pieces of it hurtling into the air, and all this forced the lid off so the food processor finally stopped going. Leaving me with butter dotted with tiny woodchips, a significantly clawed and scraped wooden spoon (it was my favourite!) and a busted food processor lid. 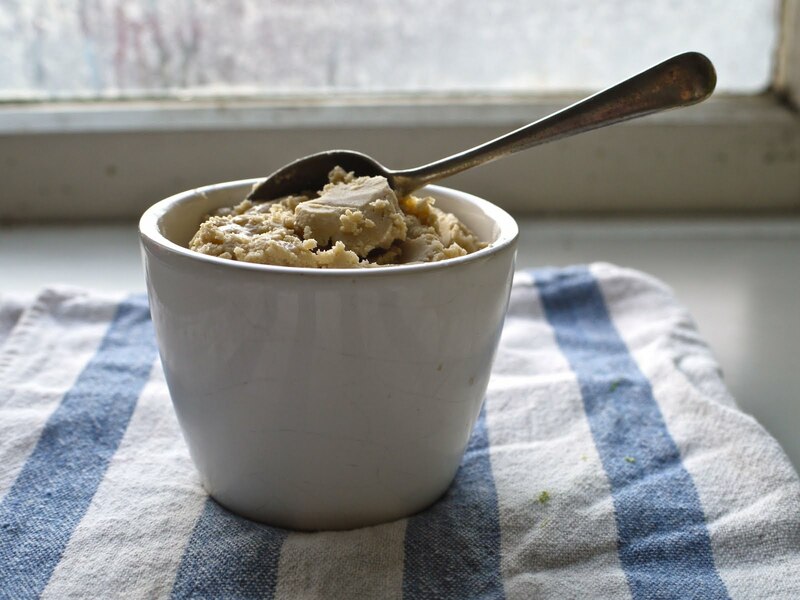 If you follow this method *except* for the wooden spoon bit, I promise you’ll have cashew butter – homemade, wildly delicious, fairly inexpensive if you snap them up on special, non-traumatic cashew butter. Unfortunately there’s no getting around the fact that you need a food processor. I kind of need one now, too. I say roasted and salted, because this is how they’re usually presented, but if yours are plain, then just roast and salt them as you wish. Place the cashews in the bowl of the food processor. Put on the lid and blitz them pretty constantly, pausing occasionally to scrape down the sides and give the motor a break. Eventually – it does take a while – the cashews will go from being crumbly particles, to forming a smooth, solid mass. This might be extremely solid, so feel free to drizzle in a little oil to soften it up a bit. Really, if you’re not going in for processor-busting shenanigans like me, the only difficult part of this operation is the horrible loud clattery noise that the food processor makes when it first starts chopping up the nuts. It’s like the sound of a massive snarling dog sitting on top of a ride-on lawnmower driving over gravel. In case you’re wondering what to do with your cashew butter, apart from eat it euphorically (it really is good) you might consider these Spicy Cashew Noodles that I brought into being last night for dinner. 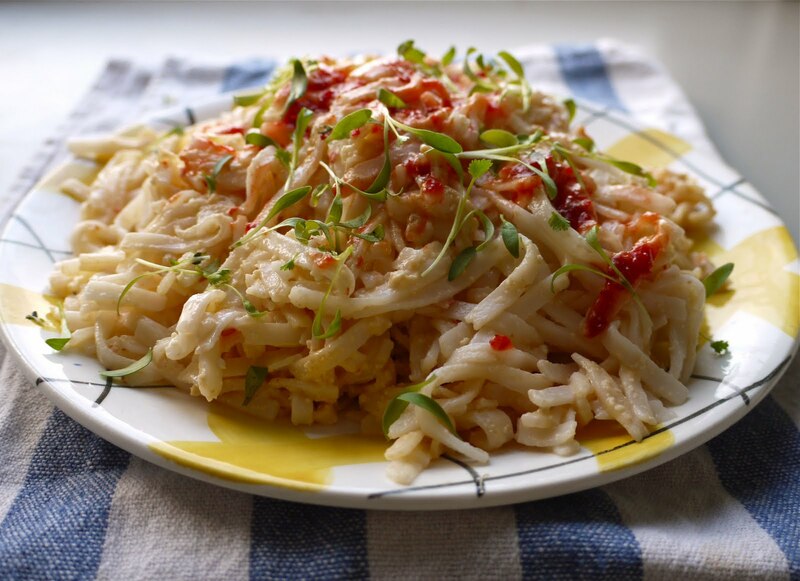 In a bowl, place three tablespoons of cashew butter, chilli sauce in a make and quantity of your preference (I used 1 tablespoon sambal oelek) and either a little finely chopped fresh ginger or a brief dusting of ground ginger. Now add about 1/2 a cup water. 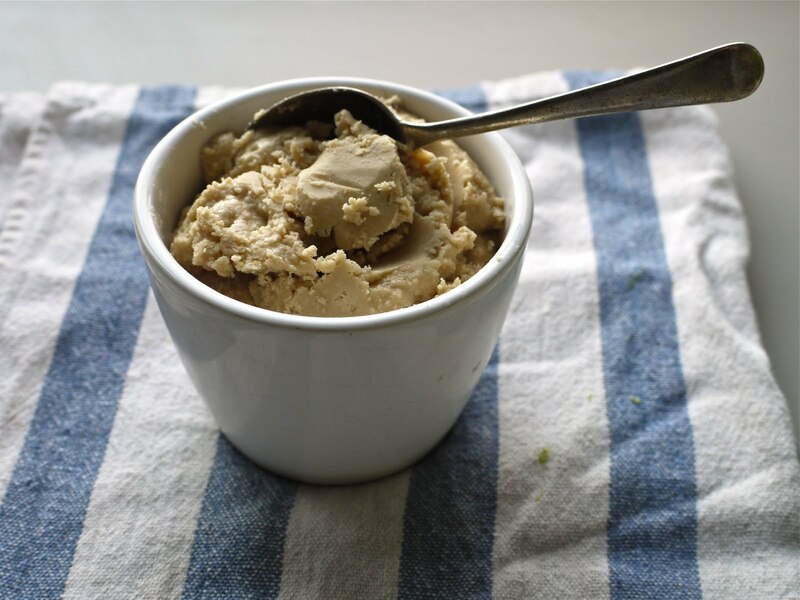 Using a fork or a small whisk, mix this together till it forms a saucy sauce – the cashew butter will magically accommodate the water so add more if you like. The cashews are already salty and sweet but taste and see if you want to add sugar or salt. Finally, mix in a teaspoon of cider vinegar (that’s what I had, I can’t vouch for the taste of other vinegars but I’m sure they’ll work) and stir the sauce through the cooked noodles of your choice. Me, I went for rice sticks. Tip over a little more chilli sauce and some coriander or mint if you like. And pa-dah. You have dinner, of sweet, spicy nutty sauce which coats each delicious strand of noodle. If cashews are out of your reach right now, you could always make this with peanut butter instead. The NZ Film Festival has started in Wellington, and Tim and I are filming it up large in response. I particularly can’t wait for Pina and The Trip. Also Visa Wellington on a Plate starts this Friday so if you’re not already – there’s a significant amount of justifiable hype surrounding it like jus surrounds a cutlet – then Get Excited and check out their website for things to do that will bring yourself and food closer together. Title via: A rare non-music title; the nut-monologue from Best in Show. A movie not quite as rapturously good as A Mighty Wind but still brilliance. Ali Farka Toure, Beto. Beautiful music. yum! I am so trying this. your wooden spoon story reminds me of when Iwas four or five, helping grandma bake a pumpkin fruit cake (her specialty). She accidentally dropped the plate holding the dried fruit into the cake mixer. she continued baking the cake before throwing it away despite it being inedible. my own mum was rather surprised by my 'grandma baked a cake with a plate in it!' when I returned home .. ! Aw no! I managed to break off the lock on my lid but a little super glue-ing fixed it back up. Hope yours can be nursed back to health! I LOVE cashew butter, but the noise is pretty offputting, you're right! Actually I was eyeing up a satay recipe the other day and wondering if it'd work with cashew (I'm not a peanut fan usually)! Love the sound of the noodles 🙂 Would be lovely with some shredded cabbage I think, to make a lovely picnic dish. Oh Spring. Please hurry up. Was expecting to see a photo of the debris – I even scrolled down in anticipation. Glad to know that no cashews were wasted in the making of said concoction. Hooray, I'm so glad to see the cashew butter was salvageable despite the wooden spoon debacle, and those noodles look delicious, almost enough to make up for a bung food processor lid maybe? Or at least to take your mind away from it? Great post Laura! Sorry to hear about your processor though. Aha the wooden-spoon eating cashew butter! Stoked you managed to rescue it. My last food processor was held together with duct tape 😉 might work for yours? Unfortunately, cashews are the only nut I still detest. But I've come around to all the others, so hopefully someday soon me and cashews will be chums. Reading this, I also couldn't help laughing at myself, for while I've made cashes fig molasses butter, I've never made straight cashew butter. And, as you may guess, cashew fig molasses butter does not a good satay sauce make. Oh no! But that is a really cute story 🙂 Pumpkin fruit cake sounds awesome, too! Yum!! Love the description of the dog on lawnmower on gravel. Might have to try that with one of ours… Now I know what KB and I are eating tonight (noodles, not dog). OMG what a disaster, one I'm sure we can all relate to having attempted the same thing. I did it with my ice-cream maker, fortunately it survived. Completely agree that macadamias are the white chocolate of the nut world. Shame about your food processor bowl. At least you were using a wooden spoon and not your finger! I know someone who tried something similar with a cake mixer and a finger and it didn't end well.